A recent NASA photograph taken by the Curiosity rover depicts a blue sunset on the red planet. A new picture has arrived from the Red Planet, and astronomers are shocked at what it reveals. Three years following Curiosity’s first mission on Mars, the NASA space rover has finally captured its first sunset. Unlike those on Earth, however, the sunset sent back from the Mars rover appears blue. According to Newsweek, there are many factors influencing the appearance of a sunset, but the simplest explanation for the blue sunset is the dust in Mars’ atmosphere, according to Curiosity team member Mark Lemmon of Texas A&M University. The fine dust in the atmosphere is the right size so that blue light is able to break through ever so more efficiently. When blue light scatters off the dust, it stays closer to the direction of the sun than does the light from other wavelengths. While the rest of the Mars evening sky appears yellow or orange, as yellow and red light are scattered throughout the sky, the dust directs the blue light straight to the eye, giving Mars its unique blue sunset. The phenomenon responsible for vividly colored sunsets is called “scattering.” Scattering affects the color of the light coming from the sky by sorting light based on its wavelength. Molecules and small particles in the air change the direction of light rays, and this changes the mixture of colors that eventually make it to our eyes as observers on the ground. Blue and violet light both have a short wavelength, and are scattered by more molecules in the atmosphere than the other colors of the spectrum. This is the reason the sky on Earth appears blue on a clear day. The wavelengths that are similar in size to the atmospheric dust bounce off into space, and we see the blue light that has been “filtered” through the atmosphere. The intense blue hue of the Mars sunset comes from the same light-scattering principles as the sunset on Earth. Light from a setting sun has to pass through the atmosphere on a longer path than it does during the middle of the day, explains NASA. The further the light travels before you see it, the more particles it has bounced off of, and the more scattered the light will be. That’s why certain colors appear more vivid at dawn or dusk. The difference in sunset colors between the two planets can be attributed to variances in atmospheric composition. We know the makeup of Earth’s atmosphere, but the blue sunset on Mars sent to us by Curiosity has many scientists wondering about the atmospheric composition on the Red planet. Mars’ atmosphere is thought to be composed primarily of Carbon Dioxide, though it is much thinner than Earth’s atmosphere. 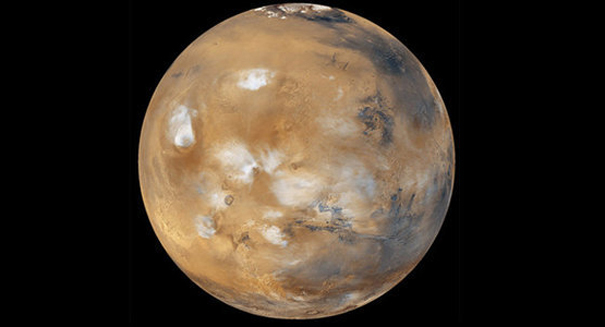 In 2003, scientists detected trace amounts of methane in the atmosphere on Mars as well, which they think could be attributed to geochemical, volcanic, or hydrothermal processes, or even to life, though this conclusion is unlikely. Mars’ atmosphere is very dusty, with suspended particles measuring roughly 1.5 micrometers in diameter. The sky during the day appears light brown or orange-red, and the sunsets are now confirmed to appear as blue. It’s almost as if it’s a mirror image of Earth’s atmospheric scattering properties. Rock samples taken by NASA’s Mars rovers in the Gale Crater offer further insight into the atmosphere on our neighboring planet. Curiosity reported methane and other organic chemicals in the powder drilled from a rock found in the crater. The samples taken indicate that the water on Mars was lost long ago, and in its absence the atmosphere has gotten quite dusty. The picture is close in color, but not identical to what our human eyes would perceive if we viewed the sunset ourselves from Mars. According to NASA, Curiosity’s MastCam’s lens is actually slightly less sensitive to blue light than the human eye. The photographs were received on April 15 from the rover’s landing site in Mars’ Gale Crater. The photos were in black and white, but contain coded information that reveals the colors originally captured. Curiosity is the second rover to send a photo of the sunset from Mars – Opportunity, the previous rover to explore the red planet, sent a photo of a blue sunset back to Earth in 2010.